Chepstow Bridge is the World's largest iron arch road bridge from the first 50 years (1780-1830) of iron and steel construction. The bridge was first opened on the 24th July 1816, and is an architectural marvel and feat of engineering that has stood the test of time. 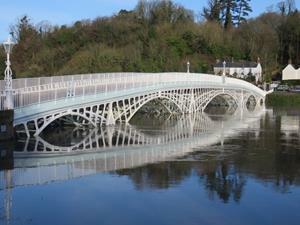 See the bridge for yourself in Chepstow and check out the fantastic views of the Lower Wye Valley and Chepstow Castle.